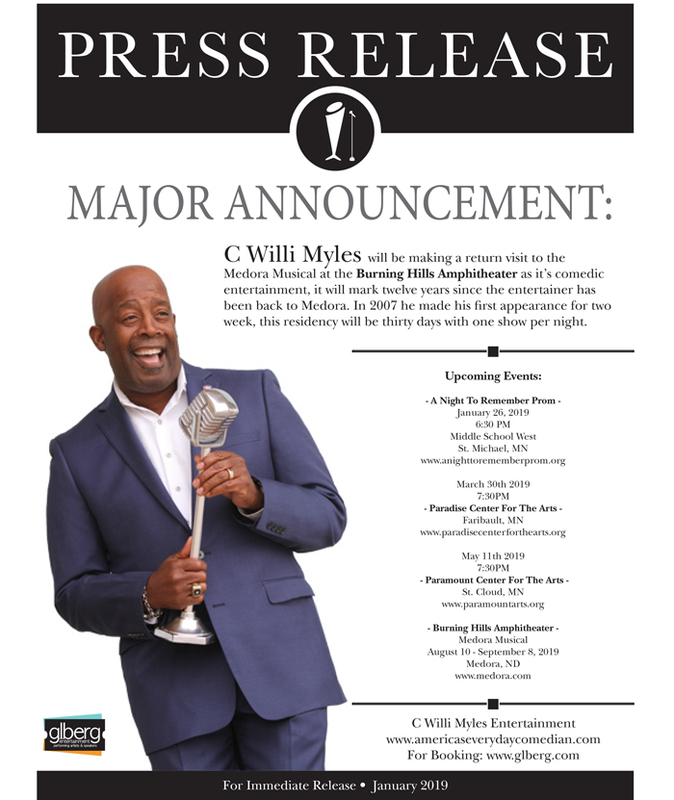 Comedian C Willi Myles, “America’s Everyday Comedian,” has been combining his quick wit and a great sense of humor to delivery one of this country’s most high energy, side-splitting shows for all ages. “Keep ‘em laughing” has been C Willi’s goal on the stage over the last 18 years and he isn’t about to stop. 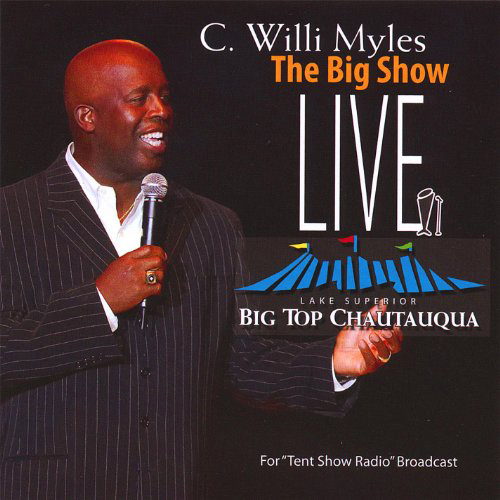 With an audience-driving interactive performance that will ‘keep you laughing,’ C Willi Myles has shared the stage with legends like Aretha Franklin, Ray Charles and The Beach Boys and Toby Keith. Yet C Willi finds that he is at his best at any venue from theaters to colleges, corporate events to convention. C Willi has the amazing ability to captivate and “keep ‘em laughing” throughout the entire performance. 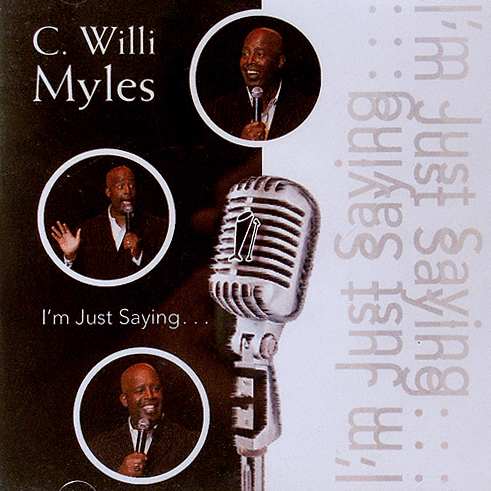 Combining everyday people with everyday humor, C Willi Myles’ humor has built dedicated audience around the country because of its non-offensive flavor. C Willi has even had the honor of performing on NPR’s “Tent Show Radio” to showcase his flair for storytelling for all people. A former student athlete and assistant coach at St. Cloud State University (MN), C Willi Myles is well known throughout the country. 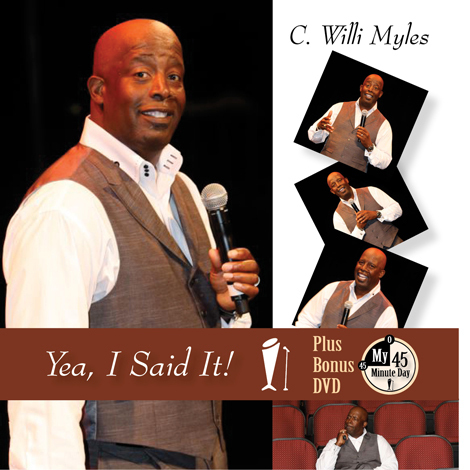 C Willi has released six comedy DVDs & CDs in the past ten years including his latest DVD, “Yea, I Said It,” recorded live at the Paramount Theater (St. Cloud, MN) in front of a sold audience at his annual April Fool Special. “The Line In The Sand,” C Willi Myles’ latest comedy hit tour, has been very well received throughout some of the Midwest’s most historic theaters. 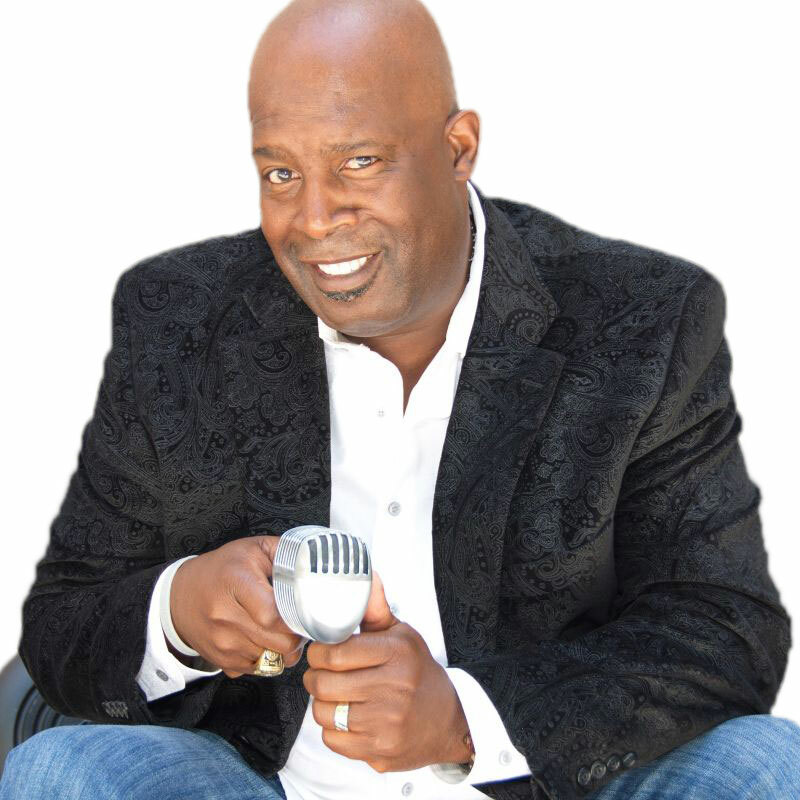 C Willi’s past experience as co-host on “The Freddie Bell Morning Show,” Solid Gold Soul (950 AM) and his performances at some of Minnesota’s largest foundation fundraising events has made him the ideal talent source for local and national TV, radio and print. One of the country’s most gifted entertainers, C Willi is ready for your next event and is prepared to ‘keep ‘em laughing’! Original music by Fonky Baldheads, "Respect." You'll find media clips on the C. Willi Myles YouTube channel. I'm not even sure if you will see this, but I figured I would give it a try. My whole family (seven of us) and some friends (two couples) were at your Saturday night show in St. Cloud. The only one that had seen you perform was my brother Troy and he just raved about you. You see we decided to go to because our family needed a night out. On April 4th, it will be 6 months since I had a ruptured brain aneurysm and several strokes. I have endless doctors appointments and therapy that my family helps me to and from. At the age of 37 I've had to move back home with my parents for support. It's been a lot on my Mom, because in May of last year my Dad also had a stroke. So she is not only his caregiver she is also mine. We had SO MUCH FUN!!! You actually called out everyone in my family that night and it was awesome. Of course we were second row dead center. I could not stop laughing, when you talked about the big and little fork.....it's something I do to my Dad all the time. I had on a pink head wrap because my hair hasn't grown back yet. Not that you remember...you have so many shows and fans. I really wanted to say, "Hi" after the show but I wasn't feeling well. So that's why I'm sending this message. THANK YOU! For an amazing night that my family and I needed so badly! It's been so long since I've heard my brothers laugh like that, seen my Dad crack up and my Mom and I wipe away tears from laughing. THANK YOU, THANK YOU, THANK YOU!!! Tim, You usually ask me after every show how things went and I normally don’t give you much feedback. This time I want to let you know that our event was great – primarily because of the entertainment!! C. Willi was a big hit. And I think he had fun, too. Our Customers just loved him. At our food show, held the next day, a bunch of Customers were talking about him – telling everyone how funny he was. I had asked for a 60 minute show. He went well over that. Not many entertainers do that. He glanced at his watch at about the 60 minute mark and just kept going. I’m frustrated because I just can’t think of the right words to tell you how good he was – how enjoyable and entertaining the show was. Often times during his show, he would start a story or joke and then pause. At that point the expression on his face said it all – and you’d be laughing well before he said another word. I’ll end by saying one last thing. I had sort of a tough and difficult day prior to getting to the party Sunday evening. I walked out with a huge grin on my face and am still giggling inside today when I remember some of the jokes and stories. That’s quality entertainment with real staying power. Thanks again for your help. You are helping us create quite a reputation with our Customers for providing quality entertainment. Thanks!! C. Willi did an awesome job. Everyone thought he was the best one we have had yet! You are going to have your work cut out for you next year. C. Willi Myles spoke for two events at our annual sales planning retreat. In the morning he did the “How to Build a Winning Team” piece. The myth of “I & Team” was especially well received and provided a unique perspective for our busy sales team. Then, in the evening, he did an excellent comedy routine and had everyone literally crying with laughter, regaling us with stories of his youth, Minnesota winters and much more! Willi has an easy, relaxed manner, warms up a crowd and holds their attention easily, and has a wealth of professional and personal experience upon which to draw for motivational speaking and comedy. It is still being talked about months later by the team and was SO worth the investment!! "He does his act with elaborate, witty anecdotes that leaves the audience rolling with laughter." "He is probably the best entertainer we have had in ten years, he is not just a great entertainer, he is a good down to earth person." "I just wanted to take a few moments and let both of you know that the feedback after the ASA banquet was unbelievable! Everyone was really happy with your performance and enjoyed the show. In past years, we would wrap up the banquet and everyone would leave. This year, everyone was so thankful we decided to do something like this and they really appreciated your entertainment. Again, thank you for joining us and we hope to see you in the future."